(CNN) -- Sen. John McCain said Sunday he would not necessarily support his former running mate if she chose to run for president. Sen. John McCain and Gov. Sarah Palin embrace after election results were in November 4. McCain said he has "the greatest appreciation for Gov. Palin and her family, and it was a great joy to know them." "She invigorated our campaign" against Barack Obama for the presidency, he said. McCain was pressed on why he can't promise support for the woman who, just months ago, he named as the second best person to lead the nation. "Have no doubt of my admiration and respect for her and my view of her viability, but at this stage, again ... my corpse is still warm, you know?" he replied. In his first Sunday political TV appearance since November 4, McCain also promised to work to build consensus in tackling America's challenges, and criticized his own party for its latest attack on Obama. 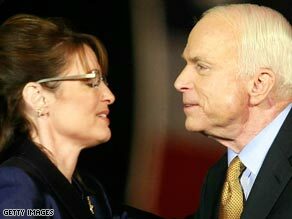 "I think that the Obama campaign should and will give all information necessary," McCain told ABC's "This Week." "You know, in all due respect to the Republican National Committee and anybody -- right now, I think we should try to be working constructively together, not only on an issue such as this, but on the economy, stimulus package, reforms that are necessary." McCain's answer came in response to a question about comments from RNC Chairman Mike Duncan. The RNC also released an Internet ad last week, titled "Questions Remain," suggesting Obama is failing to provide important information about potential links between his associates and Blagojevich. Blagojevich was arrested Tuesday and charged with trying to trade Obama's Senate seat for campaign contributions and other favors. "I don't know all the details of the relationship between President-elect Obama's campaign or his people and the governor of Illinois," McCain told ABC. "But I have some confidence that all the information will come out. It always does, it seems to me." "I think my job is, of course, to be a part of, and hopefully exert some leadership, in the loyal opposition. But I emphasize the word loyal," McCain said. "Will there be areas of disagreement? Of course. We are different parties and different philosophy. But the nation wants us to unite and work together." McCain said he wouldn't comment on whether he thought he had a good chance of winning the presidency, given the Bush administration and the GOP were perceived to be responsible for the economy's problems. McCain said he would "leave that question" for others "to make that kind of judgment." "That would sound like I am detracting from President-elect Obama's campaign. I don't want to do that... Nobody likes a sore loser." The key to moving past the stinging defeat, he said, is to, "Get busy and move on. That's the best cure for it. I spent a period of time feeling sorry for myself. It's wonderful. It's one of the most enjoyable experiences that you can have. "But the point is: You've got to move on... I'm still a senator from the state of Arizona. I still have the privilege and honor of serving this country, which I've done all my life, and it's a great honor to do so."